About a year and a half ago, I wrote a post called “why I ditched appendix carry” which ignited a bit more controversy than I’d imagined it would. Fast forward to today, and I’m writing a completely different post about how I’m back on the appendix train. Interestingly, I still stand by that post from October 2014; because at the time I switched off AIWB my reasons for doing so were valid. Just like now that I’ve switched back to it my reasons are just as valid. When I switched off AIWB, one of my primary reasons was that the majority of my shooting revolved around competition and training for competition. Unless I shoot Limited or Open, that meant my competition set up was completely different than my carry set-up. Also, despite working full time in the firearms industry, my actual time and access to training was severely limited, so it made sense to make the most of what time I did have. Things have changed since then; because while I still shoot competitively, my primary focus is much more on defensive pistol shooting these days. AIWB is faster from concealment, and after years of searching I finally found two holster/gun combos that actually work for me at the appendix position. The first was a full size (or compact) M&P in a Phlster Skeleton holster, the rig I have pictured above. That worked well enough for me concealing around town that when I went “all 1911 all the time” I decided to keep on with AIWB holsters. Right now I’m carrying in a Custom Carry Concepts Shaggy, which I’ve modified a little bit to better suit where I like the gun to sit. I’m also carrying a reload, which I keep in the excellent Blade-Tech Eclipse pouch. The Eclipse pouch keeps the spare nice and tight into my body, meaning that if I can conceal a gun, carrying a reload is a piece of cake. But I haven’t really answered the issue of why I went back to AIWB, have I? 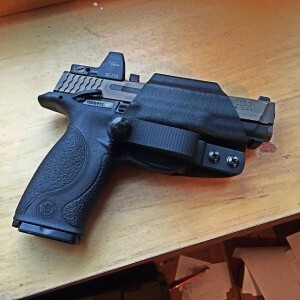 Sure, finding the right holster and gun combo was a huge benefit, but what it really came down to was a careful evaluation of why I was carrying a gun these days, and what benefits/drawbacks AIWB has. Yes, I still have to take a knee if I drop something and want to pick it up, but the Shaggy is comfortable in the car, and most importantly offers better options for weapons retention. A huge part of my decision occurred while standing in line at a grocery store in October of 2015. I was standing behind someone who was carrying behind the hip, and printing like a wild man. I could practically read his gun’s serial number through his shirt. He also was completely engrossed in his phone and had no idea I was within easy grabbing distance of his gun. Could I have taken it? Maybe. However, it is a fact that it would have been a lot easier for me to take it from that position than had he been carrying appendix. That is honestly one of the greatest advantages I can see to appendix – if you’re out and about with your gun regularly, carrying right in front of your body offers a huge advantage in weapons retention. For someone to execute a gun grab from that position, they would pretty much have to come right at you from the front. Sure, you can still be in condition white and get smoked, but at the least AIWB offers you a better chance of protecting your gun during a FUT than behind the hip carry. Bottom line however? I don’t think AIWB is necessarily better than behind the hip carry. Right now it suits my particular set of requirements better than traditional IWB carry, so it’s what I’m using. If that changed, I’d probably go back to something else. Of course, if I had my druthers everyone would just carry openly in a Safariland ALS holster and the world would be a much more civil place. Of course, you did post this on April Fools Day, so you could still retract…. Sorry, forgot to select “Notify”. And having the top photo reversed left-to-right is going to predispose people to assume prank. Well, the printing on the T-shirt is reversed (which is sometimes deliberate), but a 1911 without a left-side thumb safety? The preponderance of the evidence suggests: photographed in mirror, rather than as direct selfie, and left uncorrected. Why do you skip one of the loops on your jeans? FWIW you should give JM Custom Kydex a try hard I think it’s better then a shaggy! How do you conceal a gun on the front of your body dressed in a tucked-in shirt and sport coat, much less a suit or other professional attire? Leave the coat buttoned the whole time? That, I think, is the trade-off for the speed and control, lower actual concealability in the required styles of dress for many people. Usually anything I’m carrying in professional attire (to include anything from shirt and tie/slacks to suit) is carried in a tuckable holster. Work is a “gun-free” zone, so if I hypothetically carried there, I would have to be low profile. 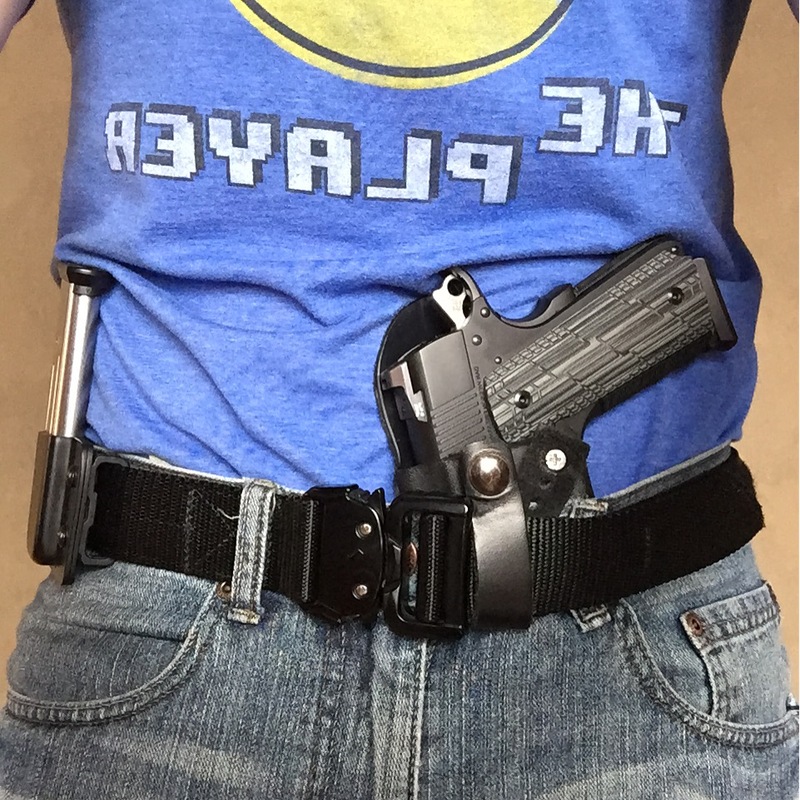 That said, AIWB is really, really good for tucked in shirts. While a Crossbreed (for example) at 4:00 is more comfortable, the draw is more complicated with a tucked in shirt. With AIWB, the left-hand rip is a lot faster. I usually carry a Kahr CM45, but have experimented with guns as big as a Glock 21. The 21 required a sweater to cover it, but it still carried all day AIWB in a Bladetech Klipt Ambi. Thank you. Where do you wear your belt line? I try appendix and can’t sit comfortably even with Commander length guns? I wear low-rise pants. My belt is at my hips and the buckle is about 3 inches below my belly button. I’m also 6′ 5″ and 220, with a pretty average build (used to be skinny, now an office-sculpted age 40). Try moving the gun around a little on your belt. Caleb’s pic above shows his against his belt buckle. I usually have mine an inch or so to the right. Also, I’ve found that patterned shirts and ties go a long way in camouflaging the gun. It’s a little more work than sticking with white or French blue and repp ties, but it does a better job in hiding the gun, simply because it breaks up the outline (patterned shirt) and distracts from your waistline (good tie). Thanks again for the details. I’m 6′ 2″ and slender, I tend to wear my pants just below my waist. I find the portion of the gun above that line wants to share space with my colon when it’s anywhere in front when I sit. I will try different locations.